March | 2012 | Save the Kales! Maybe The Law of Attraction is real after all. Starting in May, Save the Kales! will be airing as a half hour television show of the same name. 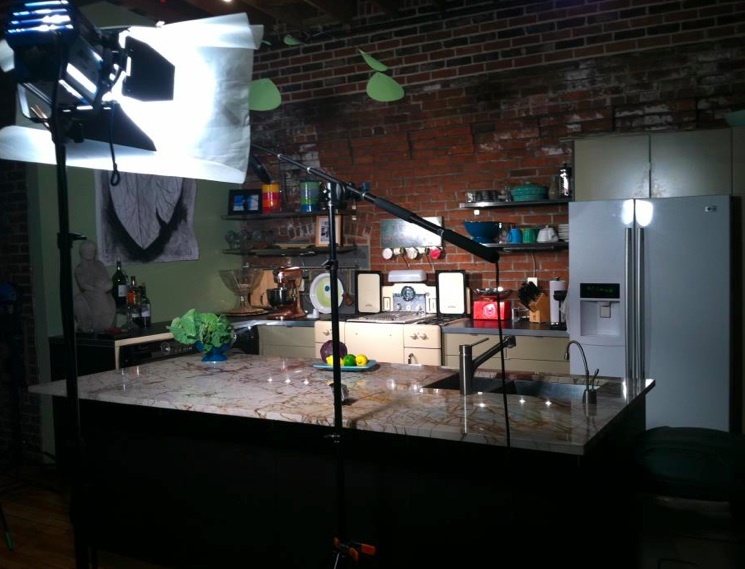 We’ll be cooking in a beautiful “studio” kitchen. 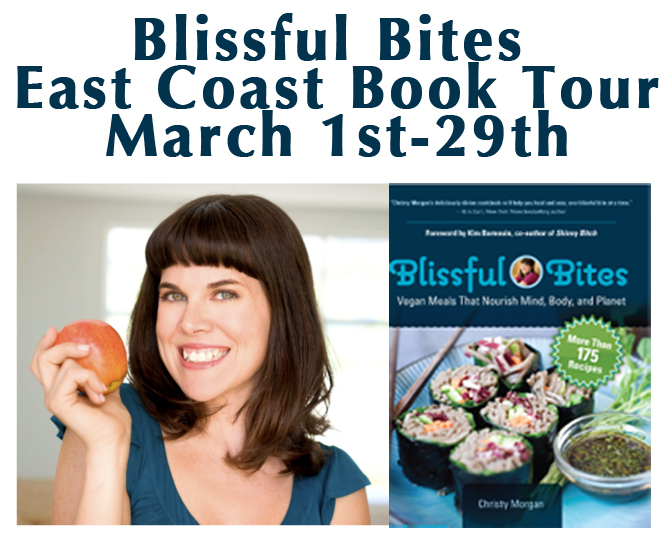 We’ll be traveling to different locations (most in or around the Lehigh Valley) to meet the people and tour the places bringing plant-based food, and sustainable and healthy living ideas to the masses. 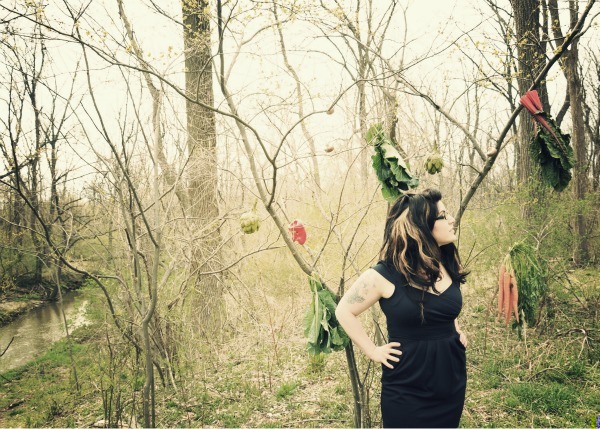 Add in a mix of vintage thrift stores, farmer’s markets, animal sanctuaries, and more… and you get Save the Kales! Show. It will essentially be this blog in television format. A new episode will air every month, multiple times a month, on RCN Cable – and be stored in the “On Demand” files so you can tune in any time. 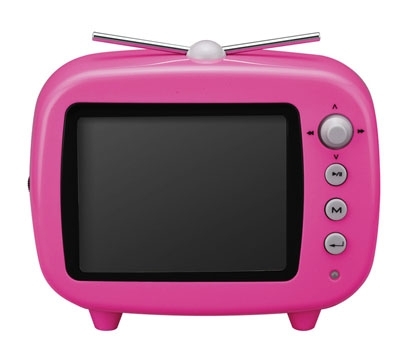 We will also air commercials leading up to each new show… which means you could be watching HGTV and see a Save the Kales! commercial. Isn’t that crazy!? (I have spent a lot of time in these last two months worrying about what could go wrong: the inevitable anonymous mean passive aggressive comments, the “She’s not as good of a cook as so-and-so, why does she get this?” speculations, the general vulnerability that comes when you put yourself in a vulnerable place… I was going to write about all of these because I haven’t been able to think about this show without thinking about them. My goal is: to make this lifestyle accessible to people. Especially those who don’t know anything about it and feel it’s too difficult, overwhelming, or expensive. It’s not any of those things, but I don’t just want to TELL people, I want to SHOW them. And at the end of each episode, if I can provide some knowledge and ideas for eating delicious plant-based meals on a budget, and hopefully entertain and highlight the people and places doing positive things along the way, it will be a success. And here’s the best part: In a year from now, we will have so much experience and so many episodes under our belt. Perhaps by then a major network will be willing to pick up a show like this in it’s roster of meat-centric programming. While that’s not my driving force, it would be a very Cinderella-magical outcome. One thing I’ve learned about trying to imagine the future: you can’t. So work hard, smile, and see what happens. I don’t know that I’ve ever been more nervous or excited for anything in my whole life. I hope you’ll come along for the ride. It would be impossible to talk about this show without mentioning Matt and Sarah of Lehigh Valley Mirror, my co-producers, directors, camera crew and editors. Lehigh Valley Mirror will also be airing as a half hour show starting in April, featuring independent and creative people and businesses in the LV. Matt and Sarah, I could never possibly thank you enough for believing in me to invest your time, skills, and friendship. I’d lasso the moon for you both if I could. You are dreams-come-true to work with. Thank you. But tomorrow, Friday March 30th 2012, all will be revealed. Check back! And I’m incredibly flattered and humbled to tell you that the blog awards just ended an hour ago, and Save the Kales! 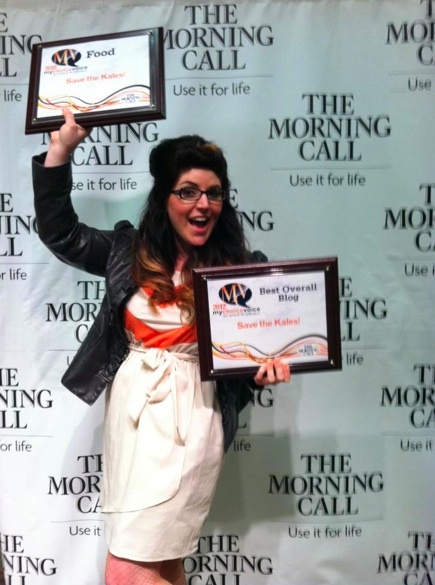 won Best Food Blog — AND, holy gosh, Best Overall Blog. Our community is full of people doing incredibly creative things with passion and drive and a desire to show that what we do and say DOES matter, our actions CAN make a difference in our communities, and if you’re lucky enough (I am; we are) you make great friends along the way. I am incredibly thankful. My vocabulary isn’t advanced enough to tell you how much it means to me. With a full heart, thank you. *Before anyone has a heart attack, that jacket is faux-leather. Hello! Hello hello hello. I’m not sure I’ve ever been so excited for a Monday. I stumbled around the house a few minutes before remembering: I don’t have to do anything but awesome things ALL WEEK. Starting today! But for now, let me tell you the rest of the week Ryan and I will finally be taking that getaway trip we tried to take a few weeks ago. Our goal is “no work” but there is so much to be done, SO MUCH TO TELL, I’m not sure we’ll comply. In any case, it’s supposed to rain and I’m perfectly content (happy, even) to take my book-pile and computer to a coffee shop for several hours and put a dent in what needs to be done. Or maybe I’ll just take a lot of baths. We’ll see. On Friday, I’ll be speaking at Northampton Community College about the inspiration and forward progress of The Bethlehem Food Co-op. I love public speaking and I love the co-op! Win-win. There were be will a few other great people on the panel from other projects and initiatives, and a question and answer session. Yay, learning! Saturday I’ll be at the Spring Home Show at Stabler Arena. I can’t tell you why just yet, but I can tell you it’ll be to officially announce The Big Secret. Which means by the end of this week, I’ll be able to tell everybody which feels both exciting and overwhelming. If you’re in town and want to learn about local companies that can help with home improvement projects, etc… come visit! I’ll be there between 2pm-4pm. So today… ah, today. 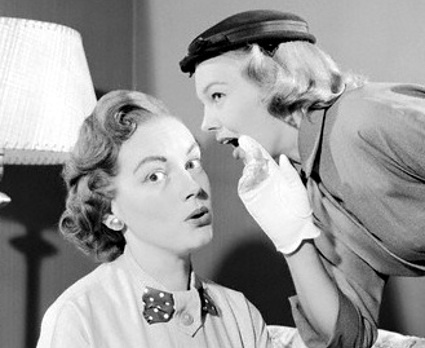 Just as I am working to squish the last of the anxieties I have about The Big Secret, I can finally talk to just the people who can offer the best advice and understanding. I cannot tell you the amount of respect and adoration I have for these two, not only for their hard working ethos and the fact that they are published authors (Allyson’s book comes out in a few months! ), but because I have had the pleasure to know them as friends thanks to the internet, and they have been excellent role models and even at times, support systems. I’ll blabber on about them after today, WITH PHOTOS, because Christy is in Philly this week for a book tour. 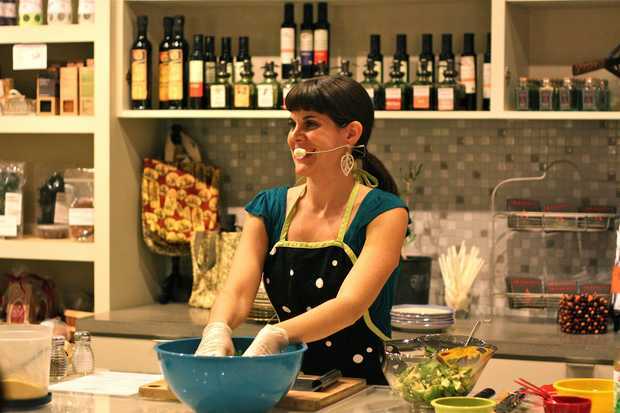 Tonight she will be doing a book signing and cooking demo at the Whole Foods in Jenkintown, PA. Give them a call if you want to reserve a spot (it’s free! ), and maybe I’ll see you there from 6-7:30pm. But once I get myself dressed, I am off to Philly to Allyson’s house where I hear rumors that the three of us will make cooking videos together. And maybe shopping! And Allyson made lunch! And and and… ? So if you haven’t already, do yourself a favor and check out their websites, Christy’s here and Allyson’s here. They are masterful! 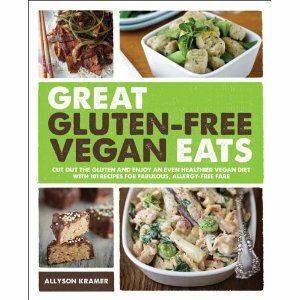 Oh, and gluten-free folks – Allyson has been cooking only gluten-free (vegan) food for the past few years. Something for everyone, just as it should be. I based the bars I made on this recipe, but there is another in Whole Living magazine this month (similar to the ones I made but drizzled in chocolate and topped with coconut, fancy! ), and my pal Stacy just found this website that gives you a breakdown of how to combine ingredients to make a ton of flavors. 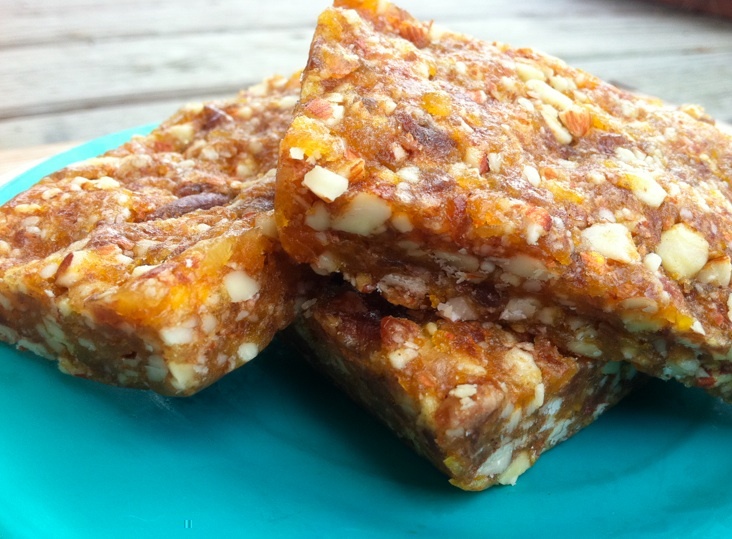 The Spring always makes me want to dive into more raw foods recipes, and the raw nuts and dehydrated fruit of these bars fit the bill. (Yes, dehydrated fruit is still “raw”.) If you’re interested in one of the best raw foods dishes I ever made, check out this raw taco salad recipe. These are so easy to make. Throw stuff in a food processor, stick it in a pan to mold the shape, and that’s pretty much it. You can, and should, do this. Get creative and share your own recipes! 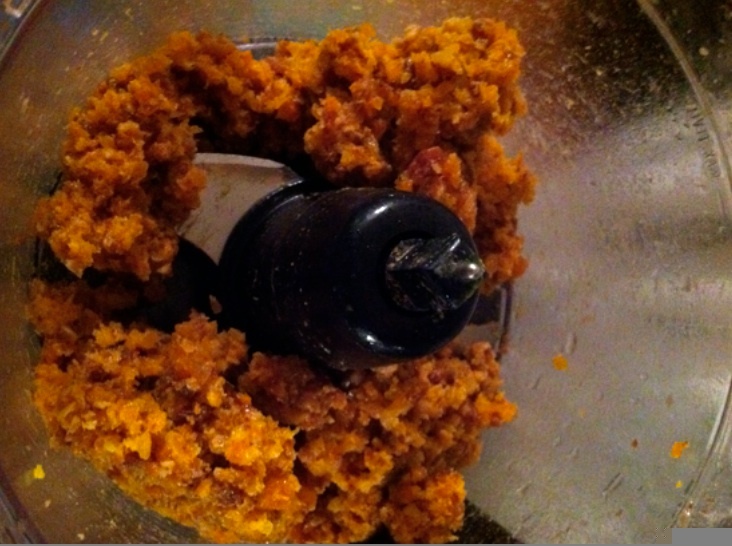 Put all the dried fruit into the food processor and process until it is a gummy blob. 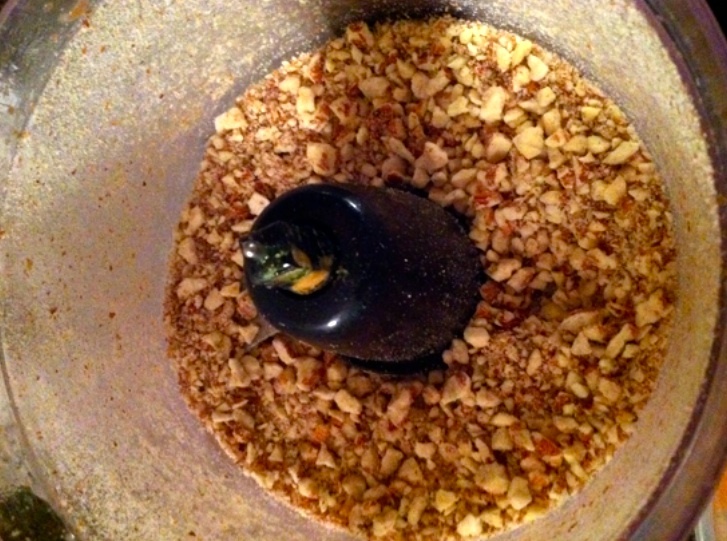 Note, this made my food processor FREAK OUT and it was shaking so much it actually started moving across the counter! I had to nearly sit on top of it to hold it down. I don’t know why this happened, but don’t be alarmed. Put the dried fruit blob into a large bowl. Put the raw almonds into the food processor and process until broken down into small pieces – just be careful you don’t completely turn them to dust! 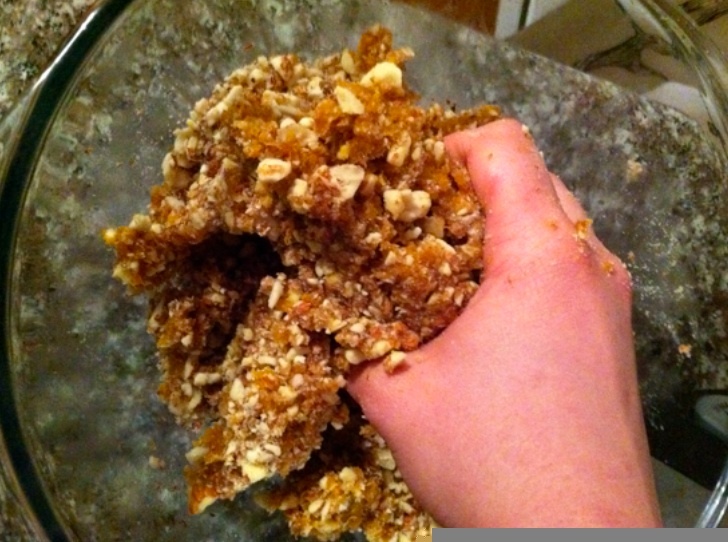 Put the almonds in the bowl with the fruit, and start mixing with your hands until everything is one solid lump. Add the pumpkin pie spice and mix that through (if using). Put parchment paper in a square or rectangle pan (nothing too big, an 8 x 8 baking ban would work), so that the mixture is about 1/2 inch thick, and flatten it even all around. You can also spray with cooking spray if you don’t have parchment paper. Put this in the freezer for 20-30 minutes to harden it up. Take it out, turn it over on a cutting board. Cut bars into the sizes you want. 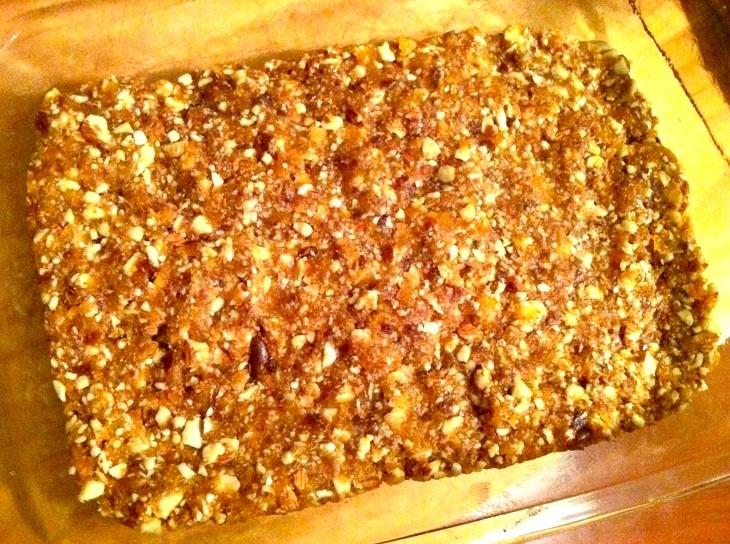 This recipe/pan size made 8 bars for me. You can also use cookie cutters to make fun shapes, and roll the “leftover” bars into little snack balls. Wrap them individually in plastic or store in a container with a lid. Keep them in the fridge. I have to imagine they last at least a week, though we ate them well before that. This recipe is so easily adapted to make so many flavor combinations. I have a few other ideas up my sleeve and I’ll be sure to share those if I try them and they work. Get un-cooking! 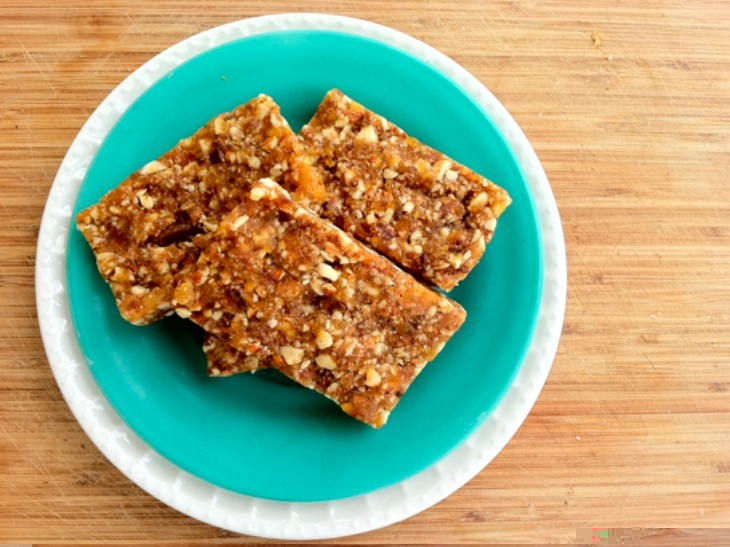 Coming up tomorrow… DIY raw “Larabars”, you will pinch yourself when you see how easy and affordable these are. Also coming soon, piles of smokey baba ganoush and a review of a swanky farm to table pop-up restaurant (minus the pretentiousness). Until then, here’s where I spent my morning. Isn’t it beautiful? Prettiest thing I ever did see. AND don’t forget: The next Bethlehem Food Co-op meeting is TOMORROW, Thursday March 22, at 7pm at the Unitarian Universalist Church of the Lehigh Valley (424 Center Street Bethlehem, PA 18018). We’ll be deciding on a logo, talkin’ t-shirts and cookbooks, exploring ways to get involved with the new Bethlehem Farmer’s Market, and more. Get involved! Bethlehem, PA Parade of ShamROCKS! Oh my, that was fun! 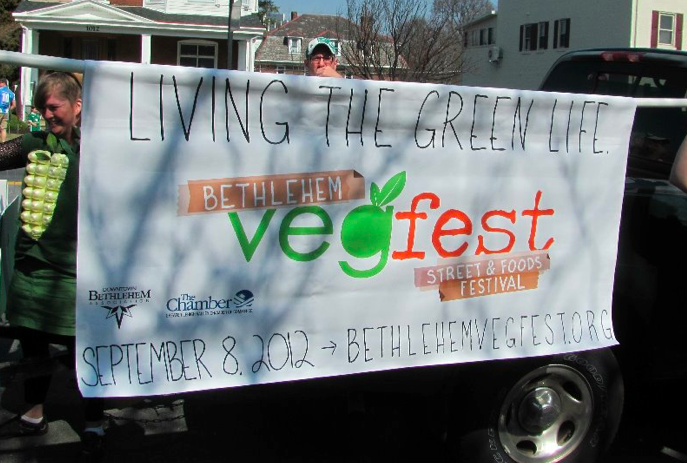 Bethlehem Vegfest 2012! September 8th! 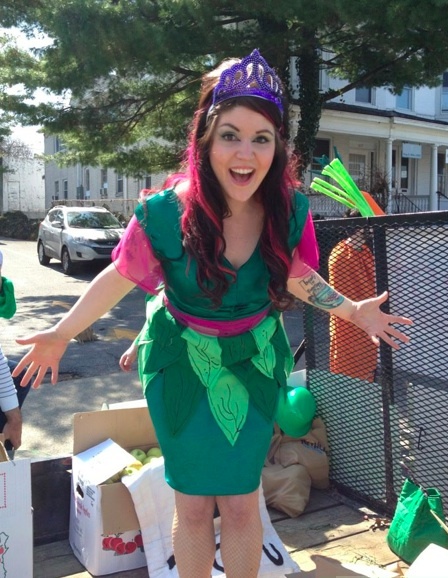 I was a little disappointed in myself for not having made my Veggie Princess costume a full-length ballgown as I intended, but it may have turned out for the best. It was a GORGEOUS warm day – and got rather hot standing on the trailer bed in the direct sun for a couple of hours, plus my hair weighs 8,000 pounds. My apron-esque skirt did the job just fine and kept me from passing out! 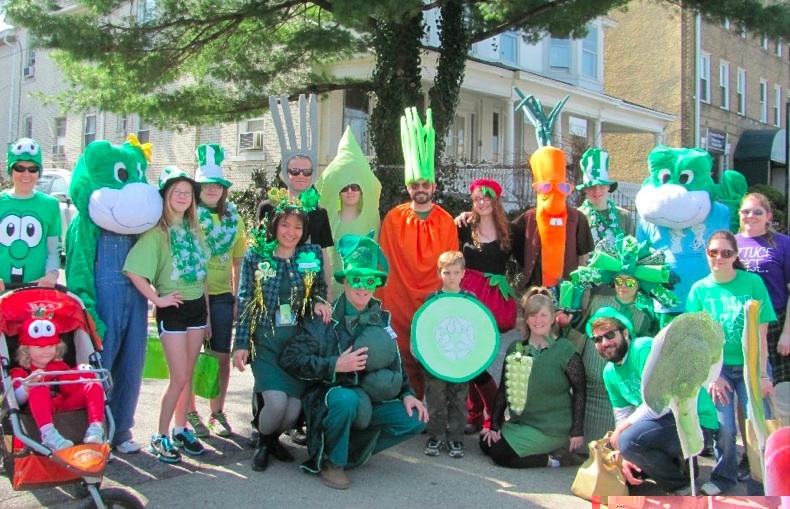 We had a nice little turnout of vegetable-walkers, and let’s give thanks to the hard work of the DBA (Downtown Bethlehem Association) for ensuring we had the best stuff to hand out: Vegfest 2011 cookbooks (yes, cookbooks! ); Bethlehem wall calendars with all the events of the year marked; and several varieties of apples from a local farm. YUM! Downtown Bethlehem Association. Festival-thrower extraordinaires. But really, what a lovely day, all around. 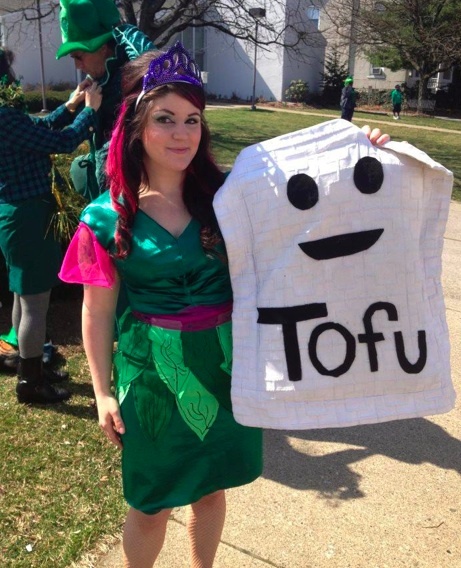 I was so impressed with the DIY vegetable costumes. True artisan craft(wo)manship! 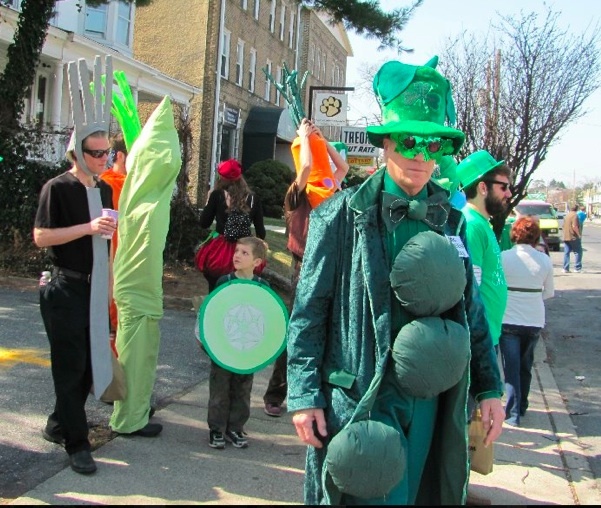 I wish these folks would consider holding sewing classes and we could all walk around dressed like food every Saturday. Why not? What a beautiful salad! 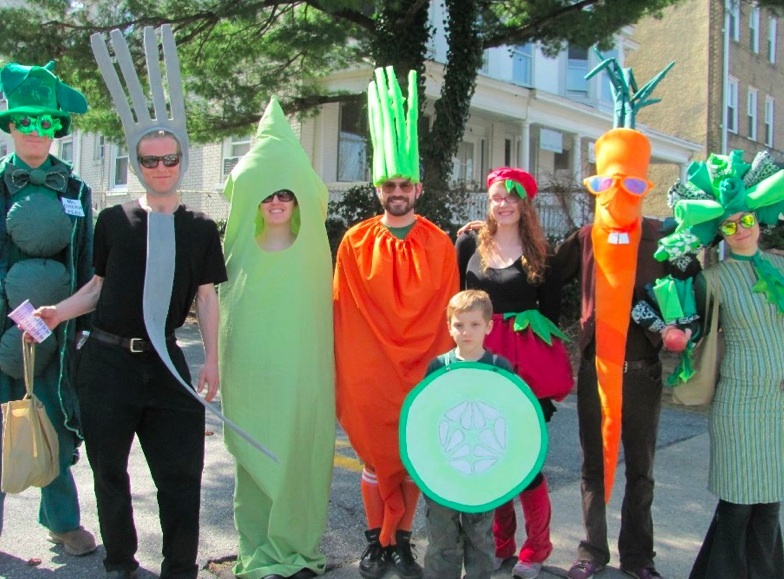 Bethlehem Vegfest parade walkers. See that cute little cucumber? He said, “I’m a PICKLE.” Ha! Me and tofu, getting an early start on our sunburns. "Mr. Green Peas", miraculously he stayed cool as a cucumber. The parade started at 1pm, but we were in the last group and didn’t get moving until probably closer to 2pm. But we got to watch the whole parade go right past us! Marching bands, elaborate floats, DOGS!!! !, so many irish dancers and their curly wigs… everyone was so happy and smiley and in great spirits! 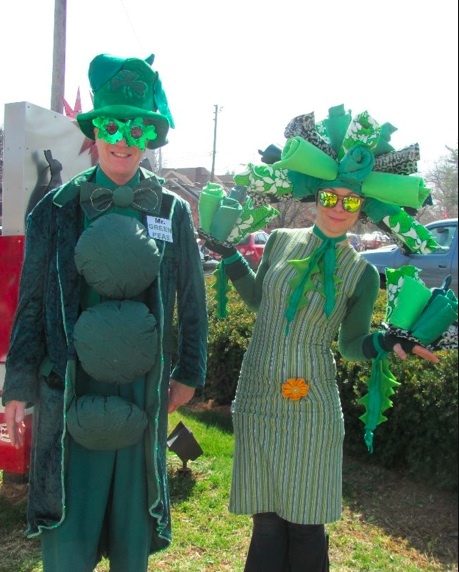 Mr. Green Peas and Tina's truly impressive, gorgeous, stunning Broccoli costume, all made from leftover material scraps she had in her house. IT WAS AMAZING. My friends Alex and Misi showed up before we took off, and Alex caught this candid photo as I was running to the end of the truck to hug them. Just pure happiness, pure elation. Friends, and community members coming together, and creativity, and sunshine… I was a happy, happy girl. This is as real as a smile gets. Our float got moving in the long line of floats and wow, it was so fun to see the street and sidewalks flooded with people waving, smiling, enjoying being in the moment. I found a bunch of my friends in the crowd – some I hadn’t seen in YEARS (hello, Jessie!) 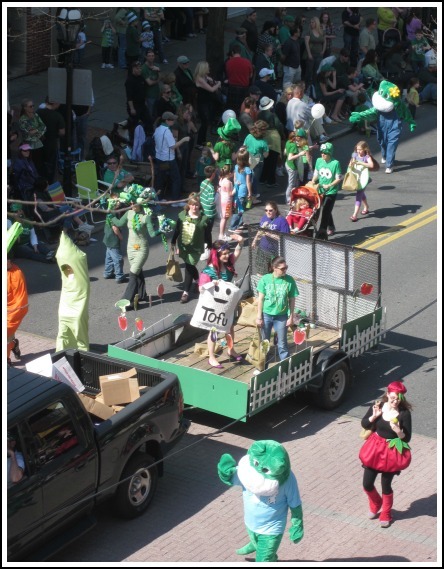 – and some blog readers even yelled out “We love Save the Kales!” when the float went by. I also saw two women realize they were handed cookbooks and one slapped her friend and said, “WHOA, HEY LOOK, A VEGGIE COOKBOOK, THAT IS AWESOME!” So cute! Ryan and some friends were perched three stories over Main Street in Ryan’s old apartment/Steve and Adam’s current apartment, giving them all a great bird’s eye view. 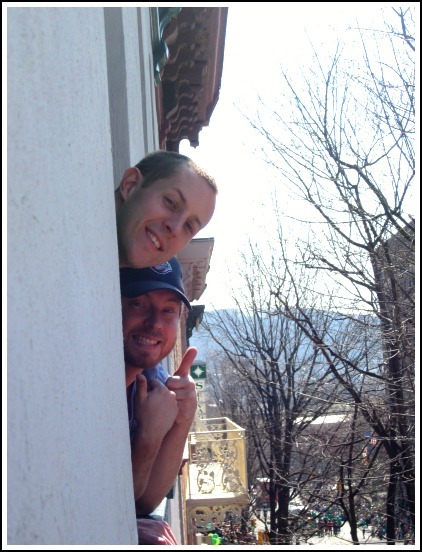 Brent and Ryan - hi guys! Be careful! THANK YOU, everyone involved, for making it such a fun day and event! Thank you Bethlehem Pennsylvania for being my home… you truly are where MY heart is. After all, why do we choose our towns and communities if not to dig in with both hands and really become a part of them? *Almost* everyone from the Vegfest float. What a delicious bunch. …. and once the parade ended, I wandered back up Main Street (after stopping to hug a lot of friends along the way) to get to the apartment to meet my friends. We went to the library book sale, tiara and all, and then Ryan took me to Vegan Treats for ice cream. CHOCOLATE MINT TWIST! What a lucky lady I am! Save the Kales! 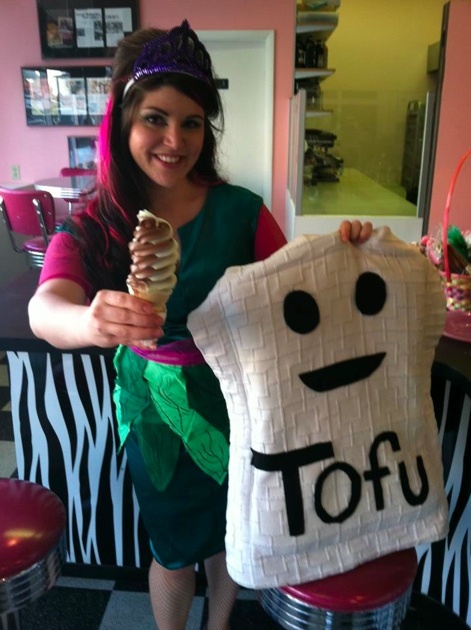 inside Vegan treats with a giant tofu. Typical day. No big deal. By then it was 4pm and I had forgotten to eat anything all day (oopsies) and the sun gave me a headache. We gobbled up our ice cream cones in less than five minutes, then went home and promptly fell asleep together on the couch. 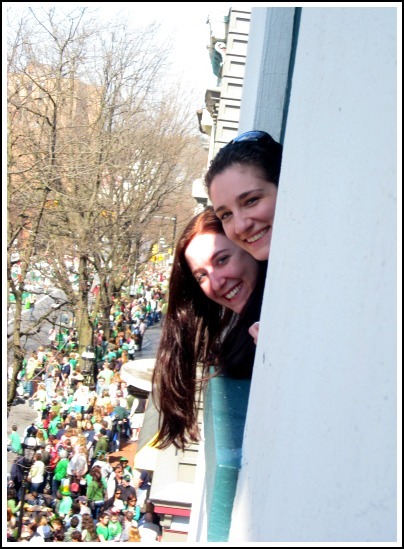 I had no idea St. Patrick’s Day could be so much fun! Cheers! Thanks to Miko, Christian, Adam and Alex… I snagged some of your photos. Thanks for capturing this fun day! I wouldn’t even consider this a real post, but being away from here for over a week makes me feel like something is missing. About that new project? Yes, yes, it’s coming along… I thought I’d have been able to spill the beans by now, but patience is a virtue I guess. The irony is, when I started cooking for other people I remember thinking “Who would hire a personal chef? 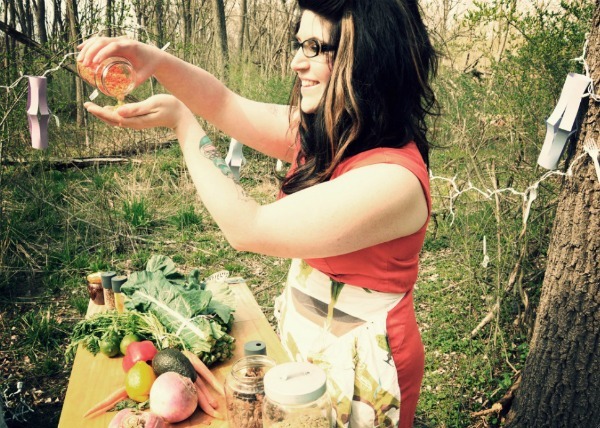 Do people actually do this?”… and now I feel like I need to hire a personal chef. Hmm. 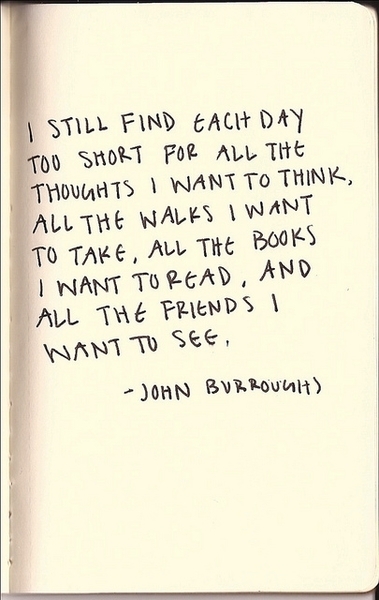 But the busyness, all of it is for good things. Recently a friend of mine said, “Wow, remember where you were in your life two years ago? So much is different now. That’s pretty amazing, isn’t it?” And it is. It very much is. Sometimes when you’re caught up in the moment, when you have so much left you want to do, it can be difficult to see how far you’ve already come. It really helps to stop and think about that. Emotionally, professionally, creatively… we go through these stages, and when we can really focus on evaluating what we’ve learned (and remember, learning is also about ACTION and CHANGE) it can make us more secure in our abilities to accomplish our dreams. 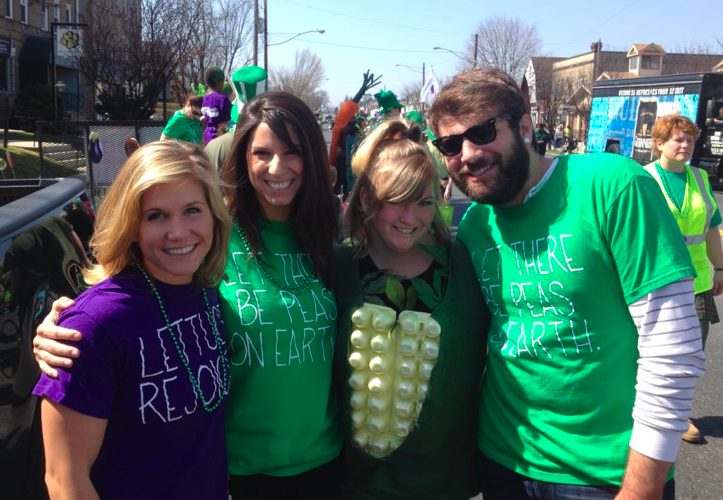 Have a great weekend — and while you’re dressing in green and drinking green beer and enjoying parades, eat some collards or kale too, okay?